I’ve warned people in the past of the potential dangers of stuffing gas, but it’s never been taken seriously. Last thanksgiving while we were putting away leftovers, I gave out the warning again. Less than two hours later I opened the fridge and this was the result. The stuffing gas had wafted up past the slices of turkey and eaten dozens of little holes in the aluminum. If stuffing gas were to be weaponized, no aluminum structure would be safe. Keep an eye on Mrs. Cubbison! This entry was posted in Home Life, Technology by Lyle. Bookmark the permalink. Was the dish the stuffing was in metal? “Stainless” steel. You think we’ve been making batteries? Yep, the aluminum is your anode, the stuffing (or other acidic/salty food) is the electrolyte and the iron is the cathode. The aluminum should convert to aluminum oxide, which is probably harmless when ingested. Oh, in case you are interested in the chemistry try searching for “aluminum-air battery”. So is this why it’s so hard to keep and restore WW2 era warplanes? I read once they were built for the duration and such long-term concerns as keeping dissimilar metals from touching was pretty much ignored. He’s right. I’ve heard it called a “lasagna cell” before. The iron/aluminum mix is well known for corrosion in other areas as well. The US Navy LCS Independence has had steel/aluminum corrosion issues…. Hell, the FFGs had to replace the bimetallic strip that connected their hull to their superstructure regularly. One would have thought the Navy would have learned their lesson by now… Oh well. Use glass for storing leftovers. Much better for you. Also, I’ve heard that “there is no place like chrome for the hollandaise,” but apparently that’s a bad idea if you use an aluminum foil cover. What then is special about the chemistry of stuffing? We’re taking the pre-mix box and adding giblets, onions, garlic, some celery and I don’t know what else. It seems we can put all other kinds of foods in stainless (we have a bunch of stainless bowls and whatnot, which we use constantly) and cover them with Al and this does not happen. So you won’t give me “Stuffing Gas”? I guess I’ll have to start investigating. I still think Mrs. Cubbison is up to something. Does it happen with Pepperidge Farm? I never saw this, but my mother generally used glass or plastic for the “cathode”. Her two stainless steel bowls she needed for our traditional next day’s breakfast of Kaiserschmarn (very fluffy pancake all chopped up). Stuffing probably just provides the best matrix for electrons to flow, while being solid enough to mound up and touch the covering. if you have a voltmeter you could check the resistance of the various foods you store like that. 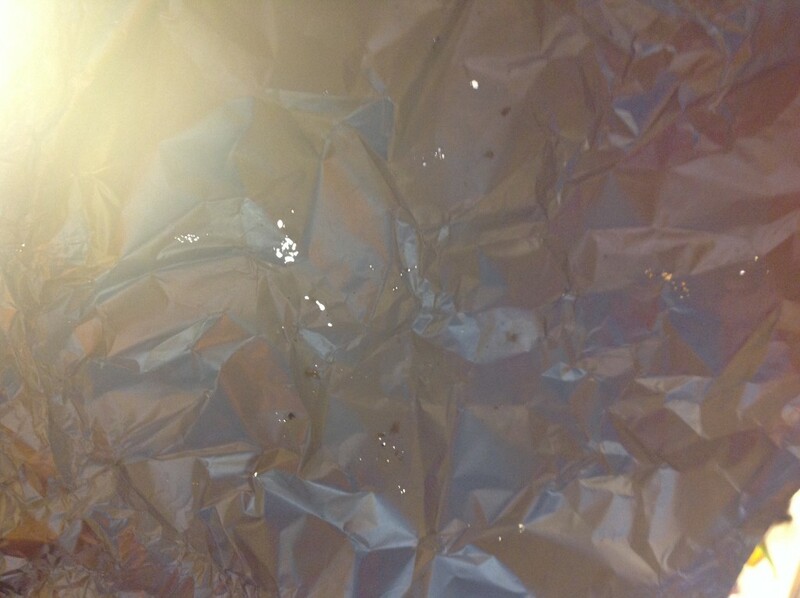 A lower resistance should correlate to faster degradation of the foil, provide the foods have similar content. It could also be that you just do not store that many foods that are good electrolytes. My understanding from chemistry classes long ago is acids and salts make good electrolytes. Check the Ph of your food and see if that correlates as well. Onions are high in sulfur. Mixes with any added salt and makes a mild sulfuric acid solution, much as when onions make you cry, perhaps? You guys make me want to get a roll of PH paper to start testing foods. Also, I take it that this won’t happen if both anode and cathode are aluminum, so Stouffer’s Lasagna from Smart and Final should be safe from this effect. Not only does this blog keep me current on news Pravda and Isvestia ignore, I learn bits of statistics and chemistry as well! A friend of mine is a chemist and pretty much confirmed what I suspected. The onion experiment is still open. Any takers?